While I do like to name Amano chocolate as one of the best, when I'm sending people to a good chocolate that they might actually be able to find in a store, Theo is a brand to choose. Whole Foods and similar stores usually carry Theo, and at around $3 for a fairly large bar, it isn't expensive for good quality and organic, fair trade chocolate. And I much prefer Theo's offerings to those of brands like Endangered Species. You know how delighted I become at finding holiday offerings of chocolate, not just candy. Theo has chosen a good route: this bar is still in their standard size, but is a holiday flavor with a well-decorated holiday wrapper. There is just a touch of color to the brown with the red, blue, and white, and just a touch of vintage accents the gingerbread man, houses, and trees. There was also a Coconut Mint bar, but I passed it by since it had coconut (online, you'll also find Nutcracker Brittle and Peppermint Stick). 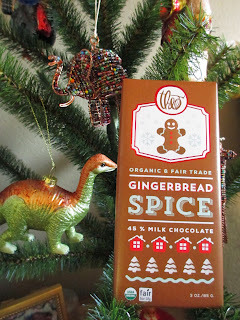 The Gingerbread Spice, however, felt right at home on my little Christmas tree with a dinosaur and a beaded elephant for friends. I'm used to most of Theo's bars having a very plain mold with no markings and about four or five rectangular pieces. But this one has eight squares, each marked with the Theo logo; I'm not sure if this is a new design or simply the mold for the holiday bars. I do, though, love this reminder of how perfect the finish is on Theo's chocolate. It's highly glossy without having the plastic shine. It's gorgeous, really. Now, I don't know if you know this, but I've been making gingerbread cookies every Christmas for at least seven years now. Hardly anyone makes them anymore, and store ones just don't taste right. So I have some familiarity with how a good gingerbread cookie should taste. 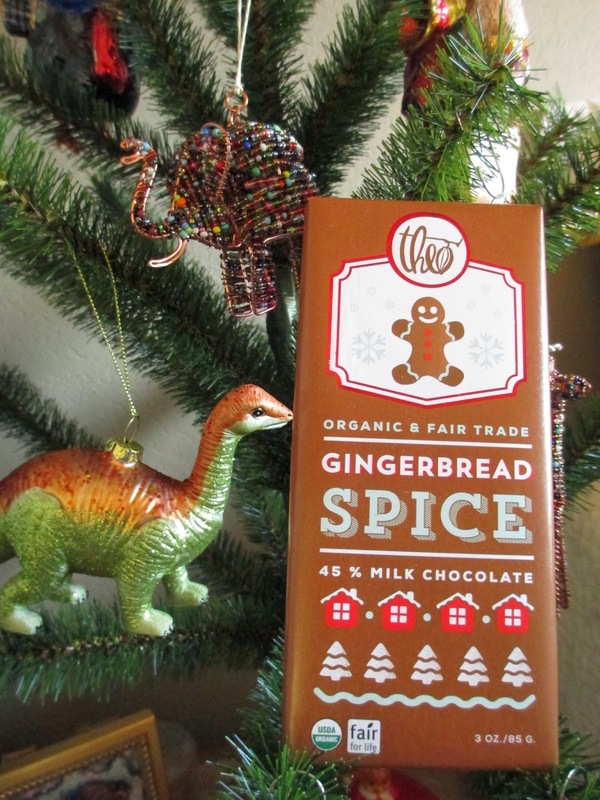 But I suppose Theo's bar isn't a Gingerbread Cookie bar; it's Gingerbread Spice. Aptly, then, chocolate and ginger are the primary flavors. But what, you ask, is wrong with Gingerbread tasting like ginger? Nothing, except that gingerbread cookies also taste strongly of molasses. There is no molasses element in this bar, unless of course you count the chocolate; I think that Theo did intend the chocolate to take the place of the molasses. Both chocolate and molasses are rich and sweet. So the translation from gingerbread cookie to gingerbread chocolate is not exact, but it works because one element (the chocolate) comes in to take the place of the other (the molasses). There are also cinnamon, nutmeg, clove, and cardamom, but while they do add in the proper accents, they're background flavors in comparison to the ginger. A word more on the chocolate. You'll note that I called both chocolate and molasses rich and sweet. This is milk chocolate, but it's 45% cocoa, which is definitely on the upper percentage end of milk chocolate. Some companies (I won't name names) will even call percentages like that dark chocolate. 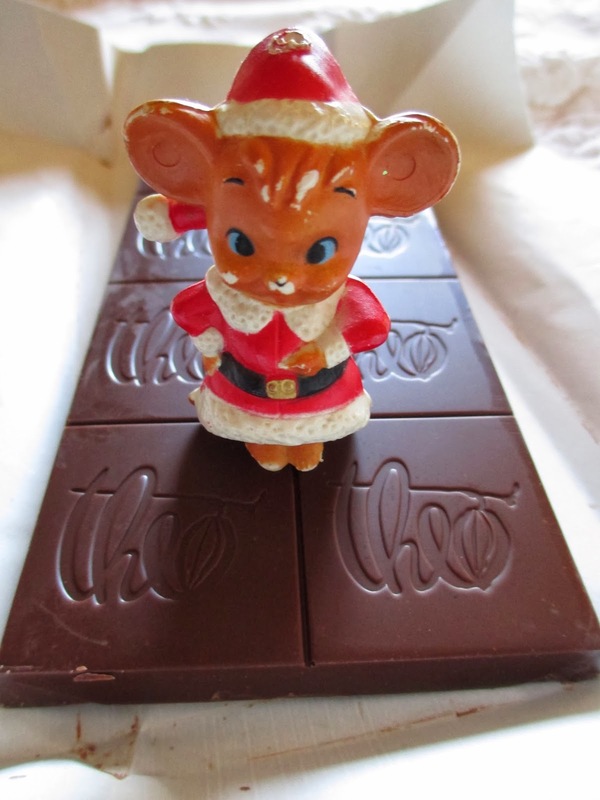 Theo happens to make a delightful dark, milk chocolate. So whatever spices are added onto this bar, you know it has a good base. The chocolate is smooth and pure, creamy in its richness, and cool against the warmth of the spices. The ginger gives the bar a bite, so it's nice to be able to temper it with the sweet richness of the chocolate. Theo, you've done well once again. My holiday spirit is glad.